Toronto, Ontario--(Newsfile Corp. - September 12, 2018) - Palamina Corp.'s (TSXV: PA) recent field campaign at its Coasa Gold Project in south eastern Peru continues to confirm the presence of high grade gold at surface in the Veta Zone where continuous channel sampling returned 1.8 metres of 19.6 g/t gold and 0.9 metre of 103 g/t gold. The recently discovered zone of surface gold mineralization has now expanded to cover an 800 by 500 metre area and further selective rock-chip sampling in the Veta Zone returned up to 620 g/t (19.9 oz/t) gold. A total of 176 geochemical samples were collected at the Veta Anomaly during the August field campaign; 155 as continuous channel samples varying from 0.9 to 4.5 metres true width across mineralized structures hosted by intermittent in-situ outcrops located on scree-covered slopes throughout the Veta discovery zone. Overall 64% of channel and rock-chip sampling results returned anomalous gold grades ( 0.1 g/t gold), 15% resulted in gold contents 1 g/t gold and 3% 10 g/t gold (or 8.5% 2 g/t gold). Four visible native-gold-hosting structures have now been discovered. Andrew Thomson, President of Palamina stated, "The footprint of the Veta gold discovery zone at Coasa continues to expand. Channel sampling has confirmed significant gold mineralization within the slate and siltstone host rocks and returned up to 1.8 metres of 19.6 gpt gold. The heli-borne geophysical survey underway is over 50% complete and will serve to better understand the prospective structures at Coasa." The 800 x 500 metre Veta anomaly is located within a larger 1.8 x 0.5 km prospective area of structural deformation (folded and possibly tectonically displaced shear zones), which accommodates lesser folded fault-shear structures incorporating both sub-parallel aligned as well as transversally aligned swarms of gray-white quartz veins, veinlets and micro-veinlets. These, in turn, are hosted by sub-vertically aligned fine-grained sedimentary sequences of slates and siltstones belonging to the Ananea Formation. 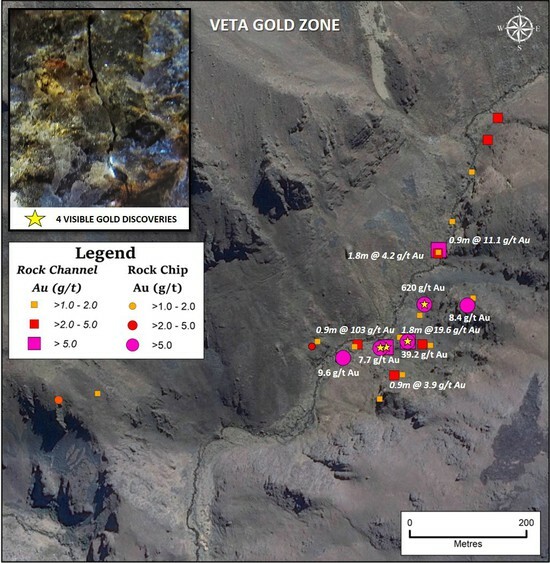 Encouraging analytical results obtained from recent sampling and mapping campaigns on the Coasa Gold Project´s Veta Anomaly are confirming the exploration potential of this highly prospective zone of orogenic gold mineralization. Up to three suites of differently oriented mineralized quartz veins, veinlets and micro-veinlets have been recognized. The most dominant suite is developed along a WNW trend. The above information, coupled with the confirmed coincidence of several established mineralizing controls pertinent to orogenic gold deposits occurring within the POGB, provides a sound grounding for future drill testing of the Veta Anomaly. Social and environmental permitting as well as drill permitting are underway. Amongst others, coincident mineralizing controls established at Veta include a recognized prospective host lithology, prospective regional- and local-scale structures, nearby intrusive bodies resulting in favourable low-grade metamorphic effects, a complex structural setting conducive to a variety of multi-gold remobilization events, a low-percentage (<5%) of sulphide content (py>aspy>pyrr), etc. It is important to highlight that visible observation in conjunction with analytical results confirm negligible bismuth, antimony, copper and other "contaminants" in association with the native free-gold mineralization detected to date at Veta. Future planned exploration activities designed to confirm the frequency and density of mineralized structures, in the build-up to trenching and diamond drilling, will include systematic channel sampling of the broad mineralized zones identified to date, soil sampling will be considered over areas without rock exposure, and possible ground geophysical studies as partial follow-up to the results of the >3,000 line-kilometre heli-borne magnetic/radiometric survey currently being conducted over the Coasa, Gaban and Cori Projects, now over 50% complete.